To change your character's appearance, press the Options button at any point during game play and select Customize Golfer. From here, you'll be able to sort through an assortment of headwear, pants, shirts and shoes options. Find the perfect outfit for your golfer, and you can change it at any time. A preview image will be shown on the left side to display what your golfer will look like. When complete, simply exit back to the main menu and continue your game. For the various in-game milestones you achieve on Golden Tee 2019 you will unlock over 1,000 virtual items in the form of Golden Tee Achievement Awards! Awards are given after every 5 games played, in addition to the accumulation of every 30 birdies, every 10 eagles and for every double-eagle and hole-in-one made. In Golden Tee 2019, players can now dress their golfers in body suits, accessories and outfits on their GT Caddy app and also on LIVEWIRE. Want to dress as a mascot or in a muscle suit? Want to throw on an earring or a new nose? In 2019, the character customization is as deep as it has ever been! Don’t want to wait? 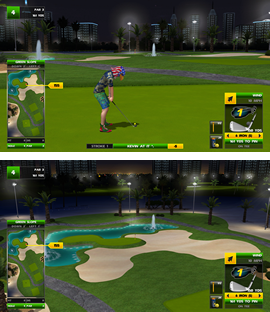 Unlock clothing items on the GT Caddy—Golden Tee’s player-centric app. Included on this app and LIVEWIRE are fun, exclusive items! Also, be sure to stay tuned to LIVEWIRE for special giveaway codes that unlock special items! The overhead layout map, or shot indicator, has been a familiar guide to Golden Tee players since the original game debuted in 1989. When using woods or irons, this simple graphic shows players where they are aiming and provides a general reference point for club distance. The shot indicator has come a long way, however, and has been updated to take weather into account along with variations in distance for high performance clubs and balls. This means that depending on what particular setup you chose to play, the shot indicator will adjust to your game – even when it rains! You’ll know exactly how high your clubs will get when combined with your player specific equipment! While the club distances are close, they are not automatic. It is easy to extend shots substantially past the general distance, so be cautious if you're trying to stretch the club. Also, despite what your distance marker shows during rainy conditions, your ball will not travel any shorter in the air. It will simply roll less after landing. A Golden Tee staple since the original game in 1989, this indicator will tell you the direction and strength of the wind (and how it will ultimately affect your ball). The further you are along your 18-hole journey, the stronger the wind will become! Whether it’s the tee box, fairway, dirt, snow or even the cart path, Golden Tee 2019 now tells you the type of surface that you are hitting your ball off of. This indicator (underneath your club selection) will help you decide the type of club needed to reach the green! New to 2019, the shot meter gives you important feedback on the direction that you pulled back and pushed forward the trackball. It also tells you how fast that you have connected with the trackball. The shot indicator is also an extremely valuable and necessary tool to use when on the green. The map is a cutaway view of the green and shows the slope of every putt. Use this to decide how you feel a putt may break and decide where you want to hit the trackball. Always pull your putter back before putting; it will give you better feel and control. Golden Tee Golf's famous trackball and directional arrows have become icons in barrooms, restaurants and taverns around the globe. Responsible for the game's uncanny control and challenge, understanding the trackball is the game's most fundamental skill. Before players can master this rollable art form, they must first comprehend the basics. To achieve a full backswing, simply roll the trackball back underneath your palm or with your thumbs until the on-screen character is fully coiled. Spin the trackball forward with some force* using your palm or thumbs to swing. * Excessive force is not necessary or recommended as the game limits maximum distance. Roll the trackball back to move the on-screen character's putter fully back*. Aim for the hole and account for the green's break which is displayed on the overhead map. Aim slightly left for right-breaking putts and slightly right for left-breaking putts. Roll trackball forward with your thumbs or palm to putt the ball. * Pulling back the putter does not have an effect on direction or distance, but it definitely helps with feel and control. In a smooth motion, roll the trackball forward to execute your chip. High-lofted irons (i.e. 8-Iron, 9-Iron) are best for clearing elevations between your ball and the green, keeping in mind that your ball will not roll much once it lands. Lower-lofted irons are great for long chips with ample green since the ball will roll further. Also, using a low-trajectory iron to chip can reduce the effect of the green's break. Volume Players can control Golden Tee Golf's in-game volume. While holding down the Fly-By button, simultaneously press the Left (volume down) or Right (volume up) buttons. Now, no matter how loud or crowded the bar gets, you can still hear the game! Camera Golden Tee Golf's Left, Right and Fly-By buttons offer players a variety of abilities and features to make the game more user-friendly and realistic. Left/Right: Press the Left or Right buttons during game play to rotate your golfer 11° in that direction. Golfers can be rotated 360° from any ball location. In Golden Tee 2019’s casual mode, you can now hold the Left or Right buttons down during game play to use the new smooth turning feature to rotate your golfer any degree in any direction! Fly-By: Fly-By is an important feature that was added to Golden Tee Golf all the way back in 2000. Simply press this button during game play prior to swinging and be given a moving camera view of the hole from tee to green. The speed of the camera will vary based on the club selected; driver is fastest and putter is slowest. The FLY-BY feature is not available inside 80 yards to the hole. 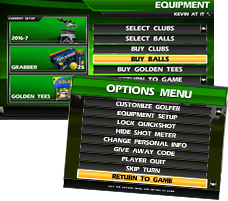 The Heads Up feature was introduced into Golden Tee Golf with the 2004 edition of the game. Hold the Fly-By button down and the camera view behind your golfer will rise to give a higher view of the challenge ahead. Something in your way? Hold down the FLY-BY button to maintain the heads up view while hitting your shot. Use this feature to gauge how high obstacles stand in front of you. See the courses from above, and take advantage of one of the greatest resources Golden Tee has to offer. Birds-Eye View gives golfers a unique perspective they have never had. To use the "Birds-Eye View" simply press and hold the blue "Help" button before hitting a shot. The camera will shift from behind the golfer to the sky, providing a new look of the hole layout and potential obstacles ahead. It's the ideal tool for identifying obstacles, dealing with elevation, seeing the shapes of the green or fairway and planning the perfect shot. The "Birds-Eye View" is here to help, and it will frequently come in handy. Golden Tee 2019's card reader offers players a variety of easy-to-use benefits and features. 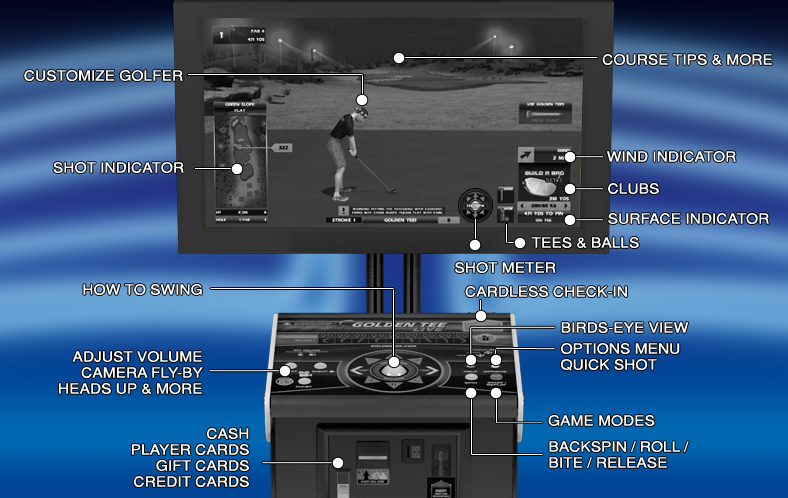 Players can identify themselves and enter LIVE competitions by simply sliding their Golden Tee / Silver Strike Bowler's Club / PowerPutt LIVE Player Card or credit card when prompted at the start of a game. Similar to express ticket check-in kiosks at airports around the globe, the game will instantaneously recognize who you are and access your accounts, personalized characters and statistics within seconds. Use either a Player Card or a credit card – it's safe and secure. All sensitive information goes through a 128-byte encryption process and is heavily secured in compliance with SHA standards. When you choose to play in an Online or Prizes contest you will be asked to identify yourself before the game begins. By simply swiping a Golden Tee, Silver Strike Bowler's Club, PowerPutt LIVE Player Card or credit card in the card reader, your Golden Tee 2019 account will be accessed and the ability to compete in LIVE contests will be enabled. No charges are made to credit cards at this time, since this secure and encrypted process is purely for identification purposes only. Golden Tee LIVE is the first arcade game in history to accept payment by credit card or gift card! When prompted to pay, you can select to Pay With Credit Card or Gift Card. Cards with the Visa® or MasterCard® logo are both accepted. Gift Cards can be purchased right here. Just like at major retail stores, GT Gift Cards are charged up and debited until empty! They also make for fantastic gifts for that special GT fan. Problems with your Gift Card or Gift Card order? Contact IT. Don’t ever take your wallet out of your back pocket. 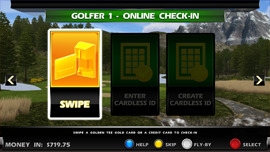 With the keypad, Golden Tee players can now securely sign in without having a card handy. Best of all, you will be able use Player Wallet earnings through this new way to enter contests. All that is required is a 10-digit number along with a four-digit pin, both of which can be secured on Goldentee.com or the GT Caddy app. When you play a game on Golden Tee, enter both items at the check-in screen and you’re all set. It’s quick, easy, safe and convenient. Cash – Insert bills into the acceptor on the front of the cabinet. Player Wallet – Use prize money won in past contests or funds added to your account on LIVEWIRE or the GT Caddy app. Credit Cards – Swipe your Visa® or MasterCard® in the card reader to pay for play! 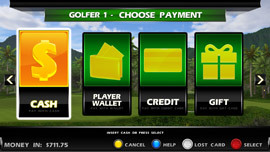 Gift Card – Swipe your Golden Tee Gift Card in the card reader and get swinging! Backspin To apply Backspin, simply press the Spin button once. You'll notice a red arrow point up on your club and will see "Backspin" highlighted as well. When utilized, your ball will land and back up when it hits the green. This will also work when hitting a ball to the fairway but won't spin nearly as much. Roll To apply Roll, press the Spin button twice. The red arrow will point down on your club and "Roll" should be highlighted. When utilized, your ball will kick forward when it lands, giving your drives, iron shots and chips extra distance. This can be especially beneficial off the tee or when hitting in rain. Bite To apply Bite, press the Spin button three times. The red arrow will point upwards slightly on your club and "Bite" should be highlighted. When utilized, your ball will land and come to a sudden stop. This shot can be beneficial when hitting onto small greens or on tough par-3s. Release To apply Release, press the Spin button four times. The red arrow will point slightly down on your club and "Release" should be highlighted. When utilized, the ball will propel forward but not with the same force as roll. It will apply some extra distance on the ground, but not the same magnitude. CasualChoose between four exciting game modes; 18 hole, Closest-to-the-Pin, pay-per-hole and a brand new mode called Real Time Rivals! 18 HolesJust play golf! Play a faster and easier game of Golden Tee without all of the bells and whistles of LIVE Play. Play the same courses but with easier conditions and drop spots. Closest-to-the-PinNo longer just a Prize Play option, players can now tackle Closest-to-the-Pin without having to compete against 49 other players. Nine holes on nine different shots—the name of the game is to get as close as you possibly can to (or hopefully in) the cup. Take on the game, challenge your friends or hone in your skills before taking the action to Prize Play. No need for the putter; this is all about the one perfect shot. Pay-to-playDon't have time for a full round of 18 holes? No problem! Pay-to-play gives you the ability to pay for a golf hole one-at-a-time! Real Time RivalsPlay against PGA pro golfer John Daly and his team of golfers in a fun and exciting head-to-head game! Golf (No Prizes Glory)Play with your custom golfer and equipment, and record your stats without participating in a Prize Play or Online contest! Golf (No Prizes Glory) is the perfect way to get familiar with the benefits of online play, without the pressure of a national leaderboard - though Hole-n-Win is available! Closest-to-the-Pin OnlineA new, old way to play. Closest-to-the-Pin, having enjoyed a long run on the Prize Play circuit is now available for online play without prizes attached. Swipe your card or sign in with the keypad, take your nine shots and see how close you can get. Bragging rights are on the line. Online PrizesChoose between four exciting online prize modes 18-Holes, Closest-to-the-Pin, Daily Contest and Money $hot. 18-Holes for Prizes Pay an extra dollar and compete against forty nine similarly skilled players in a LIVE online tournament! Every player in a given tournament plays under similar conditions, although various handicapping features may apply. In Prize Play, all games are played on Gold Tees, which are a random mixture of all tee boxes. Bronze wins $5 for finishing first and at least $1 for finishing 34th or higher. Gold and Silver win $10 for first place and at least $1 for 20th place or higher. And even if you don't win cash, you still win a free virtual tees! Closest-to-the-Pin LIVE The quick, easy and inexpensive way to play Golden Tee where one incredible shot could pay huge dividends! Thirty-Five players compete to see who can get closest to the pin or in the cup with nine shots. The $35 prize pool is then split up in the instance of a tie, but you win with a hole-in-one no matter what! Daily ContestGo head-to-head with Golden Tee players! Play as many times as you’d like on the same conditions to hone in your game, then check the online leaderboard to see where you stand. Freaky FridaysPlay a new course each and every Friday on the Daily Contest! All par-3s? All par-5s? Hardest setup ever? All closing holes? You have to check out the Daily Contest each Friday to see which collection of LIVE holes is featured that week! Monday MixupIt’s the same course… but with a twist. Every Monday, tackle a familiar Golden Tee creation in a way you’ve never seen before on the Daily Contest. Monday Mix-Up takes the holes on a given course and jumbles them up—creating an entirely different pace and playing experience. Money $hotIn Money $hot, players have the opportunity to win huge cash prizes with one shot, and this shot doesn’t even have to go in the cup. The catch? There’s no cup. That’s right, this mode is all about getting it as close to the pin as possible. Only your best shot counts. The 24-hour contest will run each day, and the hole for that day won’t change. Each player will get three shots per game played at the same pin from the same tee box with varying wind conditions. With 2019, players have the option to purchase 6 games at one time for the price of 5. Not satisfied with your result? Play again on the same hole with new conditions. Play as many times as you like. One shot. That’s all it takes, then check the online leaderboard to see where you stand. Player InvitationalPlayer Invitationals allow players the opportunity to coordinate their own contests. Pick the people, pick the course, pick the stakes and then play your games! Please note: You cannot create your Invitationals contest on a Golden Tee 2019 cabinet. All contests are created and accepted on the GT Caddy app. Events ModeWe want to see what you want to play, and this ambitious 2019 mode will take a variety of factors that include wind, tee boxes, entry fee and more to change the way Golden Tee is played. We're turning knobs that we've never turned before to offer different types of prize play contests that YOU, the player, have never experienced before. Maybe we will offer 20 man prize play mode with a $2 entry fee for a chance to win bigger prizes. Maybe we will give you the opportunity to shoot low scores when we turn on casual tee boxes to be used with your custom clubs and balls! We even have the ability to control the speed of the wind! Never experienced 19 MPH winds before? Guess what, now you might! Hole-n-Win Win BIG playing Golden Tee on one amazing shot thanks to Hole-n-Win! Play an 18 Hole registered game of Golden Tee 2019 for Prizes, Online Contest or Stats Play. During your round, you'll receive one or two Hole-n-Win opportunities at either 50 cents or $1. If you hit a hole-in-one on a par-3 or a par-4 after accepting the offer you'll have the opportunity to win prizes up to $500! For official Hole-n-Win rules, click here. The Options Menu is the player's hub for customization and game options. By pressing this yellow button during game play, players will be taken to a menu that offers a myriad of customizable attributes that are designed for personal preferences and to increase the game's overall entertainment value. Here's how it works. 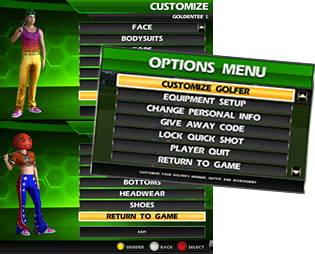 Customize Golfer Pick a gender, choose a face, and deck your golfer out in thousands of possible outfit combinations! Earn unique pieces of clothing for milestones and achievements! Equipment Setup Choose clubs and balls that are designed for your personal playing style. To select or purchase equipment, highlight and select "Equipment Setup" prior to teeing-off on the first hole. Buy Clubs – Shows Club Sets' features and benefits and offers players a one-time purchase of $2 per set for permanent use. Clubs can be purchased on the game or the GT Caddy app. Buy Golf Balls – Shows the features and benefits of available Golf Balls and offers players the option to purchase them for 50¢ a dozen. Like real golf, these balls are consumable - lose one in the water and it's gone. Be sure to stock up on the first hole! Purchase balls on the game or the GT Caddy app. Players have the option to auto refill their bag once they are close to running out! Buy Golden Tees - Allows players to purchase Golden Tees in sets of 10 (50¢), 25 ($1.00), or 60 ($2.00). Tees can only be used on a tee box and each tee can only be used once. Once selected, that tee will be subtracted from your total available. Purchase tees on the game or the GT Caddy app. Players also have the option to auto refill their tee inventory once they are close to running out! Select Clubs – Arms player with any of the purchased club sets prior to tee-off. Select Balls – Choose to use any of the purchased balls prior to tee-off. Hide Shot Meter Worried about your buddies copying your moves and stealing your shots? Or maybe you’re in match play during the Golden Tee World Championship. Either way, you can easily hide the shot meter by accessing the Options menu at any time during the round and select “Hide Shot Meter.” You can follow the same steps to turn the shot meter back on at any point during your round. Change Personal Info Players can edit their name used for LIVE contest leaderboards. This simple feature is available at the start of any registered (swiped-in/checked-in) online game before teeing off on hole 1 and will be saved for future events. To edit your leaderboard name simply highlight and select "Change Personal Info" from the menu. Use the trackball to select your desired nickname and select "Done" once you're finished. It's quick and easy and the change will be made instantly! Give Away Code Players can enter special Give Away Codes to unlock a variety of unique and entertaining Golden Tee items. These Give Away Codes are released on LiveWire.com and can be redeemed on the game. To Enter a Give Away Code press the Options button and select "Give Away Code" from the menu. Use the trackball to enter the 10-digit code, press "Done" and your unlocked item will then be displayed! Play Random Tees During a multi-player Online Contest game, players have the option to compete from the same random tee boxes despite any difference in their Skill Bracket! At any time during the round players can access the Options menu and select "Play Random Tees." This is available in both single and multi-player games. In Stats Play games, players will be placed on silver tees which is a combination of random tees for that particular hole. Lock/Unlock Quick Shot Lock and Unlock Quick Shot at any point in a game. Simply press the "Options" button and highlight and select "Lock Quick Shot" to speed up your game without having to press a single thing while you play! Select "Unlock Quick Shot" to turn this feature off at anytime. Skip Golfer Need to take a break? By selecting this, players can skip one's turn without penalty. This way the entire foursome does not have to wait while a player takes a bathroom or beer break. 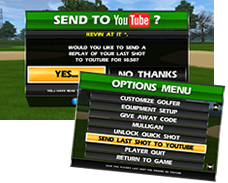 Send Last Shot to YouTube™ In Golden Tee 2019, any shot can be saved and shared. To upload your last shot, simply press the Options button and select "Send Last Shot to YouTube." You'll then be prompted to enter an email address or phone number, pay a small fee and verify this email before the shot is uploaded. For more information on the process, click here. Player Quit If a player has had enough, they have the choice to quit out of whatever game they're currently playing. Return to Game If a player is done with the Menu screen they can return to their current game.